At Elite Landscaping and Sprinkler Repair, we don’t just mow your lawn or rake your desert landscaping; we take care of it like it’s our own. Simply put; we are committed to quality service and your complete satisfaction. As a full service landscaping company we are proud to offer everything from consultation, irrigation, low voltage lighting design and installation, masonry, new construction and re-design, scheduled maintenance, fertilization and much, much more. Whether you require our landscaping Phoenix services for your home or commercial property, we can help you meet your specific landscape needs, all while remaining within your stipulated budget requirements. 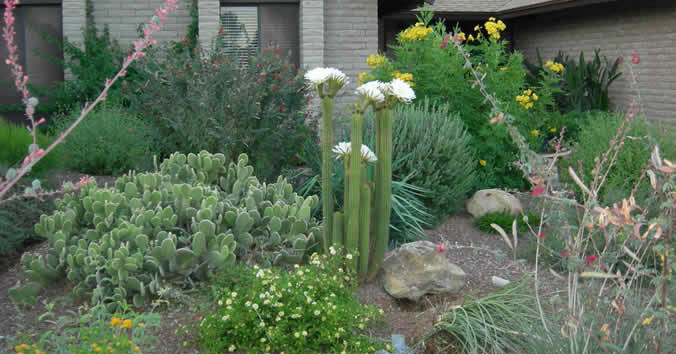 Our extensive approach to bringing life outdoors, by designing and subsequently developing an ambient and beautiful environment, is made possible by our 32 years of landscaping Phoenix services experience. With certified landscaping professionals we can creatively address all of your landscaping’s management needs in the minimalist of time in order to design or redesign the landscape of your dreams. Skillful landscaping construction, when completed to your specifications, builds landscapes that are sure to bring life outdoors for years to come. You can count on Elite working with you every step of the way. Whether you require weekly or monthly, you can count on Elite providing superior maintenance services for your landscaping, and common areas. We are dedicated to meticulously caring for even the smallest of details and prompt response times. With over three decades of experience, and advanced techniques, we fully understand the needs of each of our individual clients. Having this understanding affords us the opportunity to keep your landscaping looking beautiful regardless of the season. Our current landscaping Phoenix services clientele includes residential estates, entire municipalities, shopping centers, hotels, HOA communities, apartment buildings and common areas. All of which require different landscaping maintenance requirements.